Soon after the blitz tournament of the Tal Memorial was finished, there was held another short ceremony. Mark Glukhovsky, the editor-in-chief of "64" magazine, went to the stage to announce that actually nothing extraordinary has happened: the traditional prize Chess Oscar, established by the magazine, is again awarded to Magnus Carlsen. Thus, Norwegian has been voted as the best player of 2012 by the journalists and other chess players. Carlsen has been awarded the Chess Oscar for the 4th time in a row. He didn't get any shy and thanked those who voted for him, "I think it's well-deserved." This is what GM Shakhriyar Mamedyarov posted on his Facebook page regarding the Candidates tournament which has finished in London. 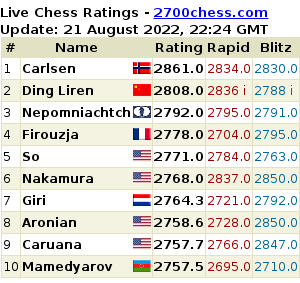 Congratulations to Carlsen. He deserved... Today, not everyone knows who the second player of the world is but everyone knows who is the first! Alexey Dreev Compared Carlsen & Karjakin: Karjakin "is Palying Real Chess", While Carlsen "Awaits for the Rival's Mistake"
The awarding ceremony of the winners of the Tal Memorial took place yesterday in the center of digital technology "Krasnij Oktyabr" in Moscow. The blitz tournament, which has opened the 7th Tal Memorial, has just finished in the Pashkov House. 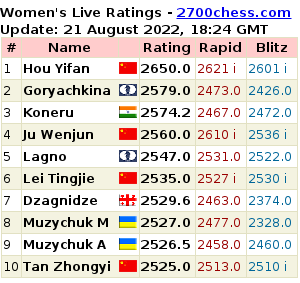 Perhaps, the most unexpected result is Vladimir Kramnik finishing in the penultimate place. The former world champion scored 2.5 out of 9.